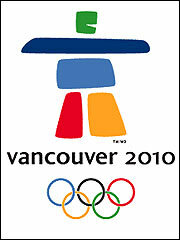 Organizers of the Vancouver 2010 Winter Games unveiled their Olympic logo over the weekend. It's called Ilanaaq and it's an inukshuk, a symbol deeply rooted in Inuit culture. You can see it here. Some like it, some hate it. A colleague just told me it looked like something his kid drew in kindergarten. Two B.C. native leaders say some First Nations people feel slighted by the new logo and question why the emblem doesn't have more West Coast influence. Everybody has an opinion on this subject, including me. I like the emblem. It's warm, enjoyable to look at and clearly Canadian. I tried to jump on the "I hate it" bandwagon, I was rooting against their bid, but I dig it. Go figure.